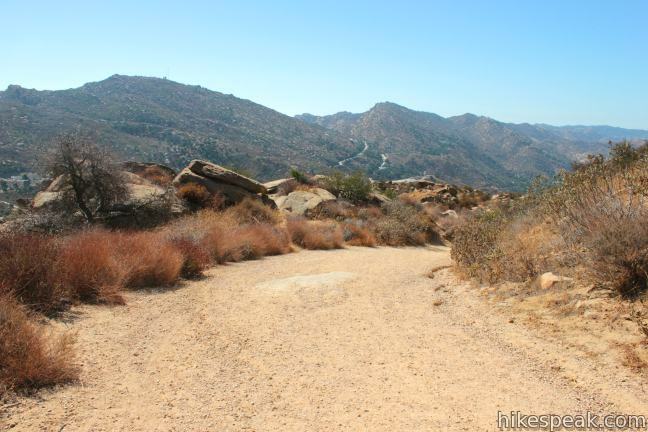 The first two miles of the hike follow a wide fire road up the center of the park. 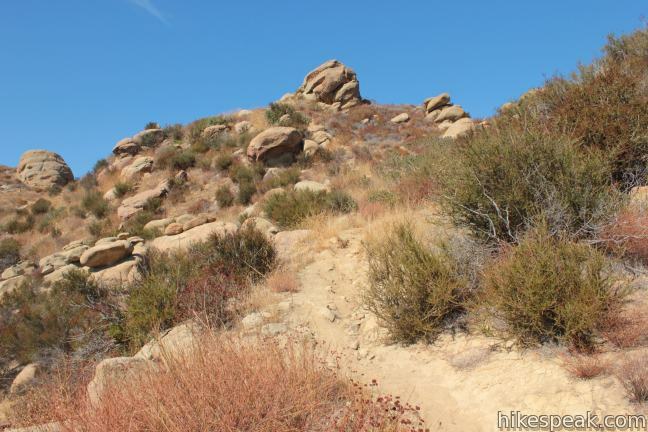 Then to reach the summit, you’ll have to scramble over boulders on a less used path. 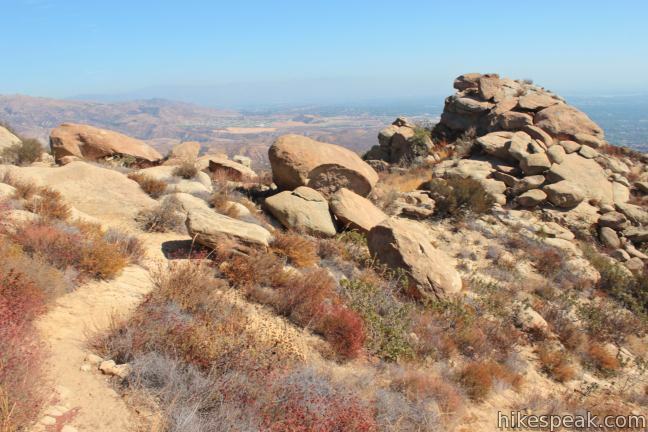 It is an exciting 4.75-mile round trip trek to the top of Rocky Peak with 900 feet of elevation change. 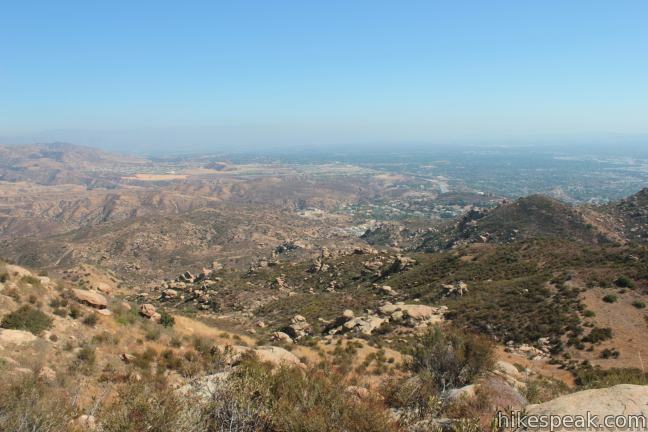 With a rocky and rugged feel akin to the American Southwest, the Santa Susana Mountains are unlike other ranges in Los Angeles County and Ventura Cuonty. 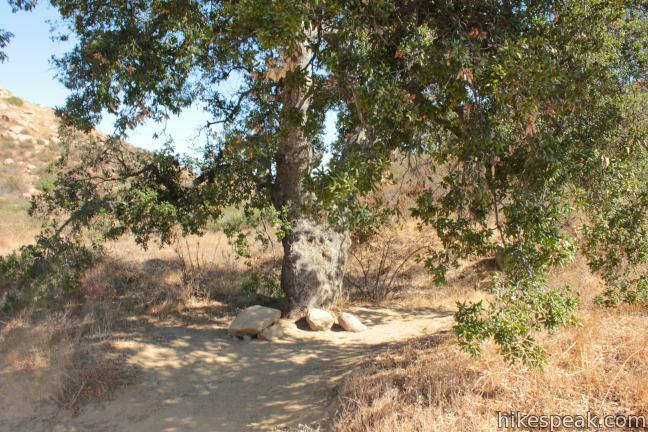 Only one tree along this trail is big enough to provide any shade, which can make the arid landscape tough for hikers during the hot, dry season. 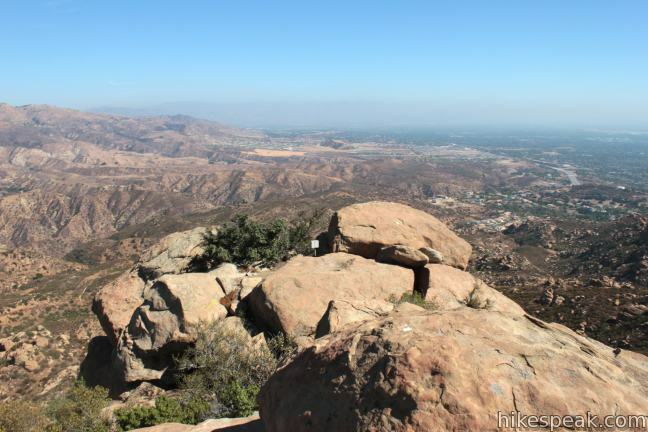 Save this hike for a cool day and don’t skimp on the sunscreen. 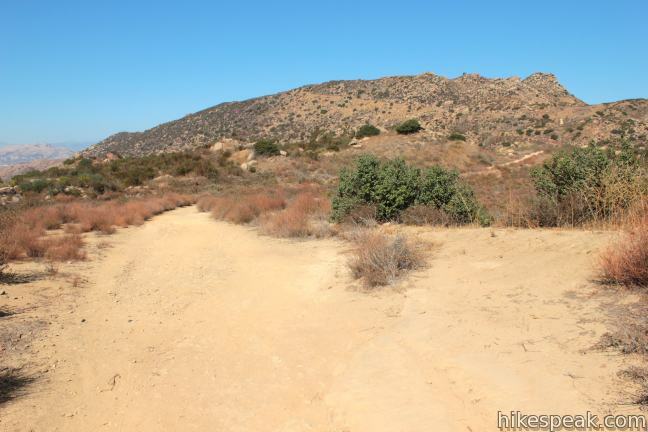 The trailhead is easy to reach, located at the end of an offramp along Route 118 between Simi Valley and Chatsworth. 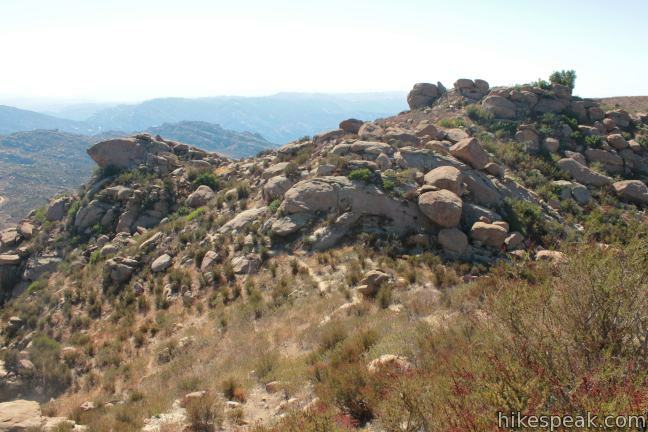 Set out north up Rocky Peak Trail into a garden of sandstone boulders. 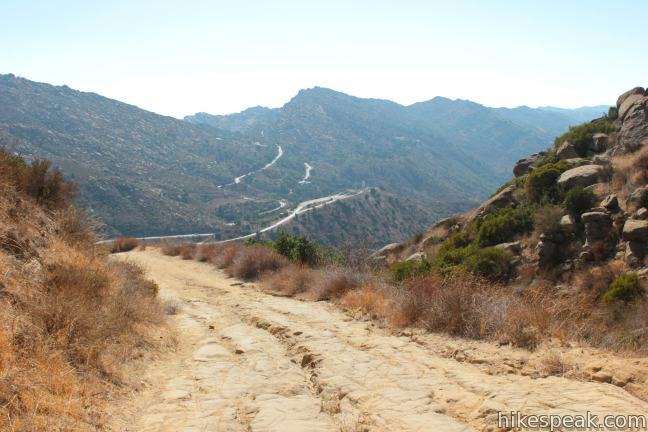 The pavement ends after less than a tenth of a mile giving way to a road of dirt and bedrock that launches up the mountainside. 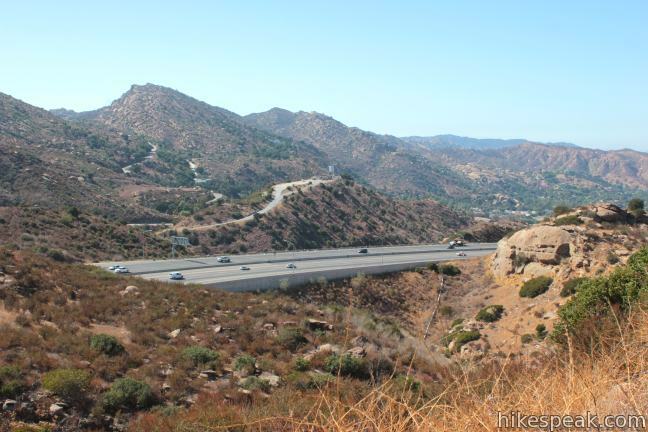 A pair of hairpin turns deliver early westward views over Simi Valley. 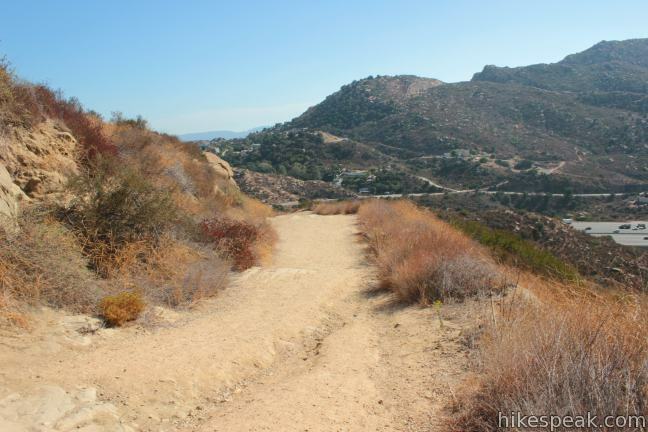 Push up the main trail past a trio of offshoots on the right. 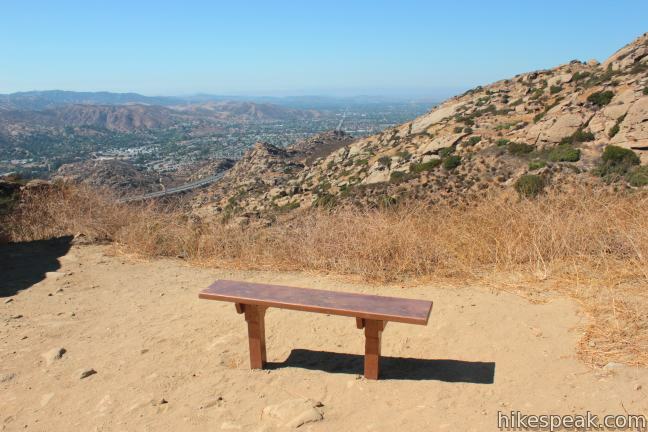 After 0.6 miles, in which 115 feet of elevation are gained, arrive at a restful park bench along the left side of the trail, placed to offer a grand vista over Simi Valley. 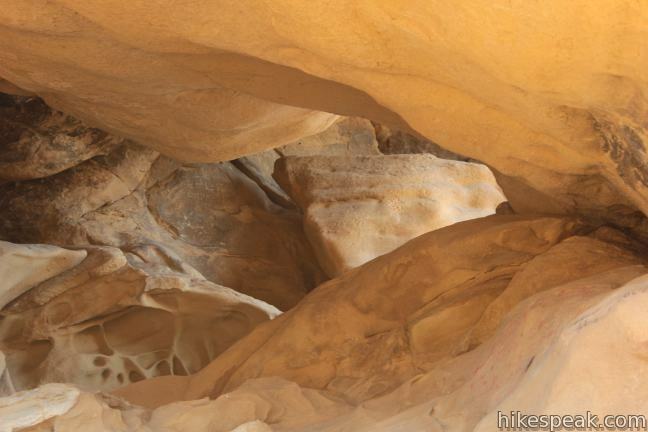 Shortly after the bench, and 0.75 miles from the start, pass a sandstone wind cave on the right side of the trail. 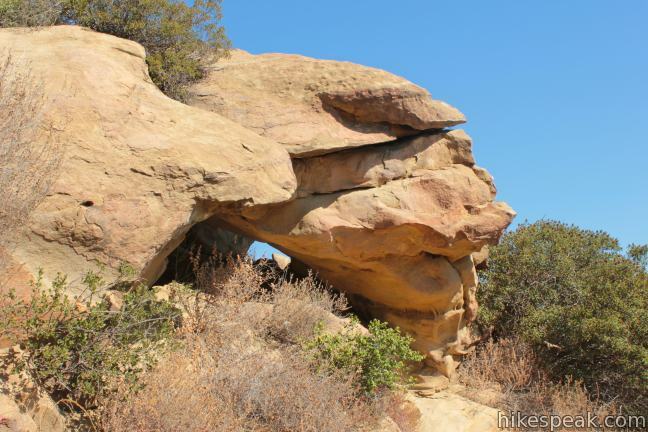 While large boulder formations are numerous along the trail, this golden tunnel is the hike’s most impressive natural feature. 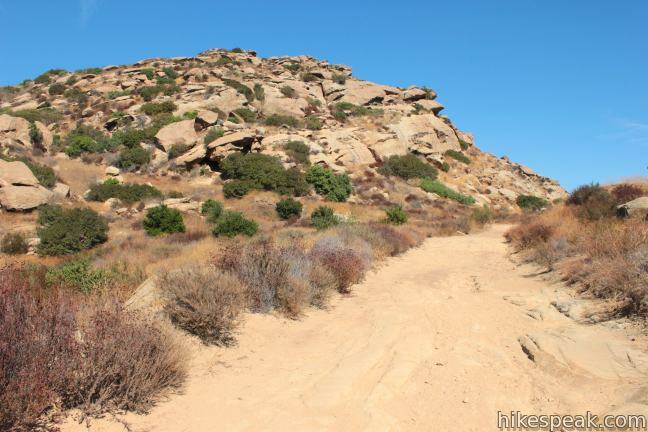 Climb inside and poke around before continuing up the trail. 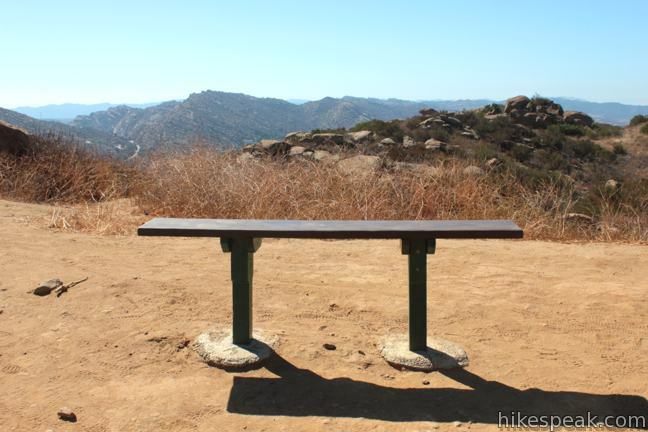 Less than a tenth of a mile past the cave, reach another bench and a marked junction with the top of Hummingbird Trail on the left side of the road. 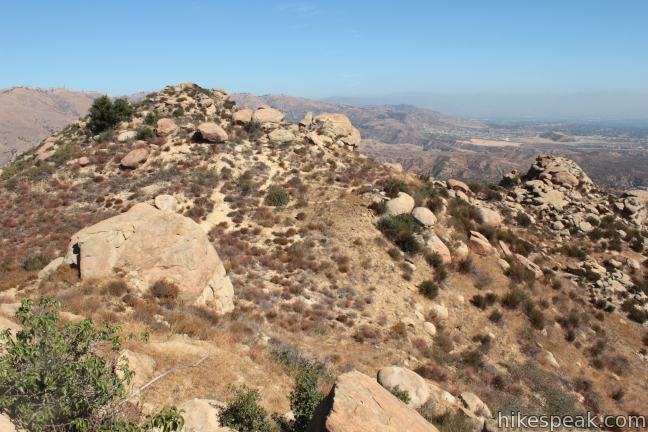 Stick with Rocky Peak Trail, which continues uphill through walls of boulders. 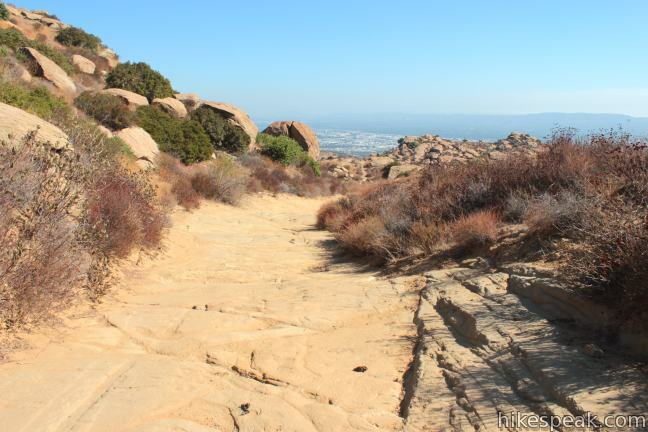 At the one-mile mark (after gaining 335 feet), the trails slips through a rocky pass and tapers out. 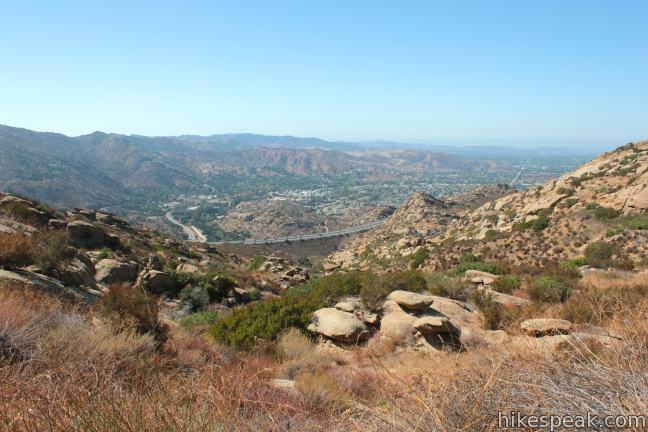 As you catch your breath, you will catch broad views to the east down a rocky slope toward Chatsworth. Climb to a level bend to the right where Rocky Peak finally comes into view, about 1.4 miles from the start. 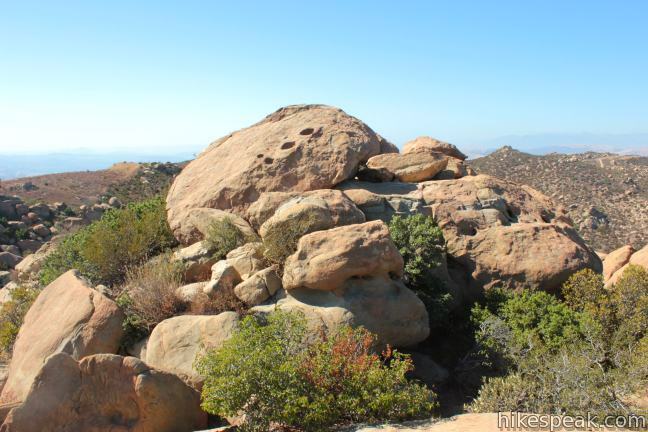 Rocky Peak is made up of a wide cluster of boulder-covered points. 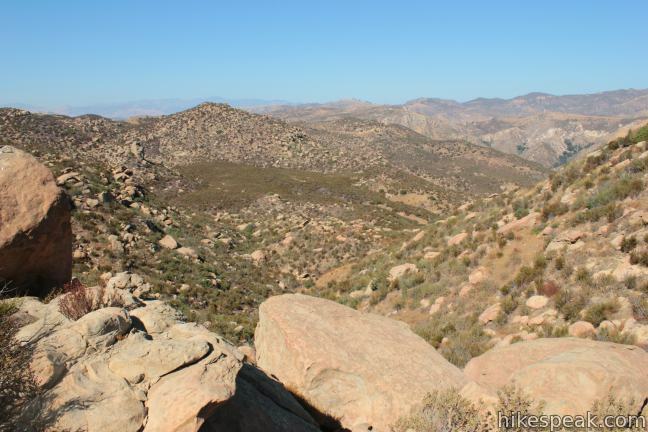 The actual summit is the farthest point to the east, though it is difficult to distinguish from this vantage. 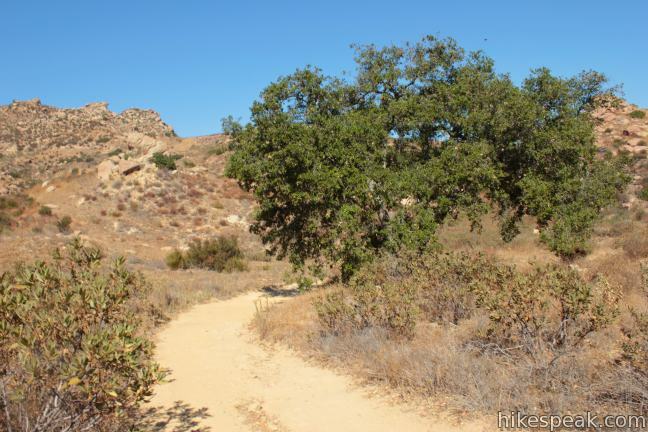 Rocky Peak Trail crosses rolling terrain for another third of a mile to a solitary oak along the trail. Take a break in the elusive shade, 1.75 miles from the start, before making the final push for the summit. 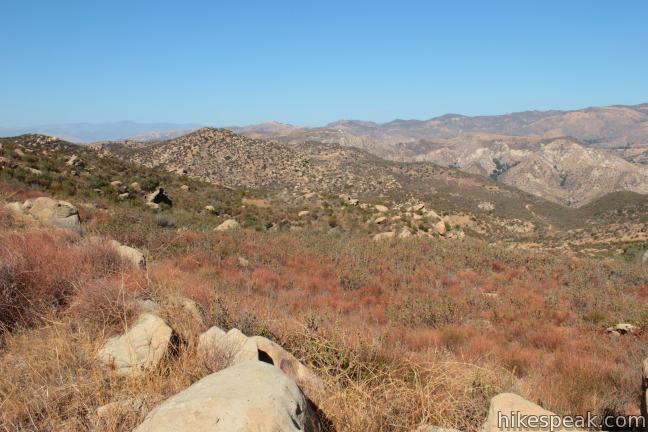 Proceed up the slopes of Rocky Peak for just over a quarter mile beyond the oak tree. 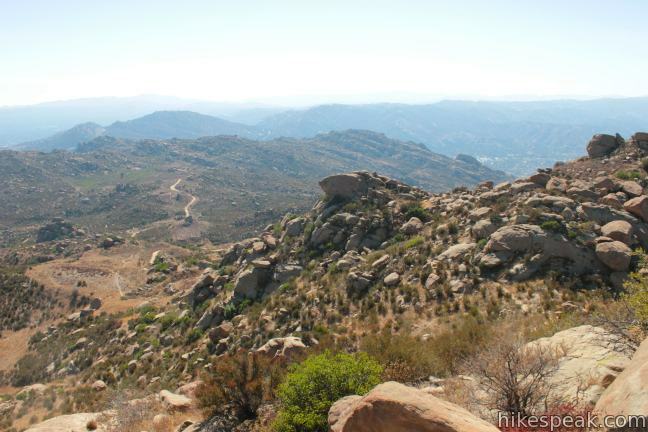 When Rocky Peak Trail bends to the left, tackling the west side of the mountain below the summit, look for a path breaking off to the right that rises above the road to reach the summit. 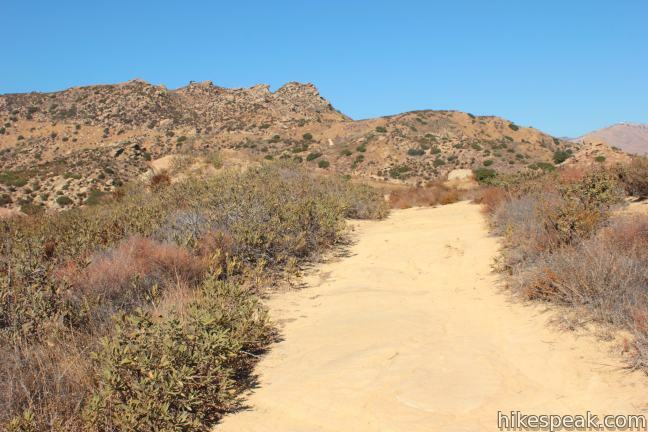 From this unmarked junction, it is another quarter mile up the path to the top of Rocky Peak with 340 feet of elevation to gain. 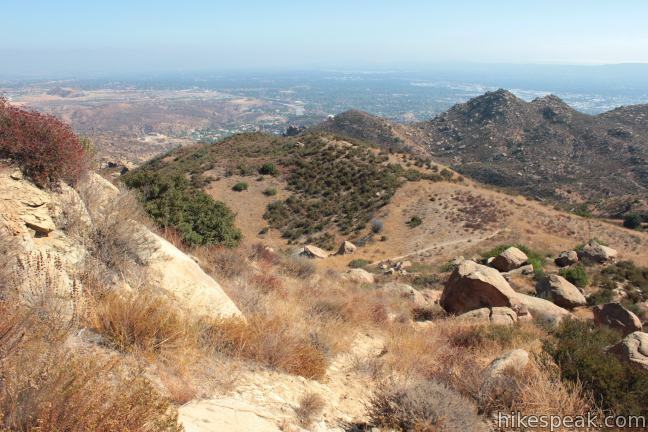 A tenth of a mile up the path, reach a level spot below two rocky peaks. Here the path seems to split. 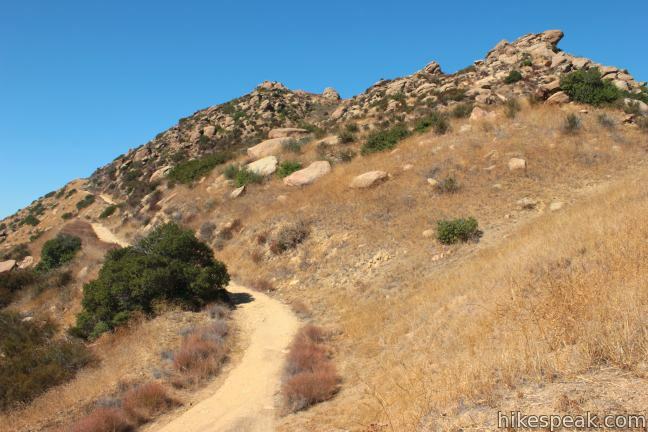 Stick with the most worn path as it climbs up the left side of the western peak. 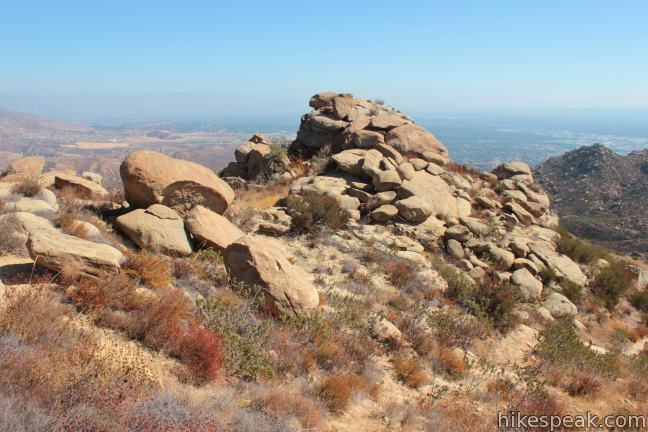 After 0.15 miles of steep rugged climbing, pass a pile of boulders just beneath the top of the point that you have been climbing, which turns out to be a false summit just west of the true summit of Rocky Peak. 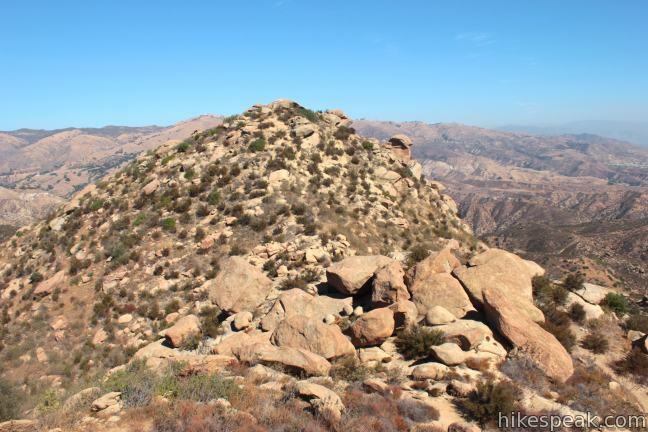 Between the boulder pile and the top of this false summit, you will find a footpath heading to the right toward the true summit of Rocky Peak. 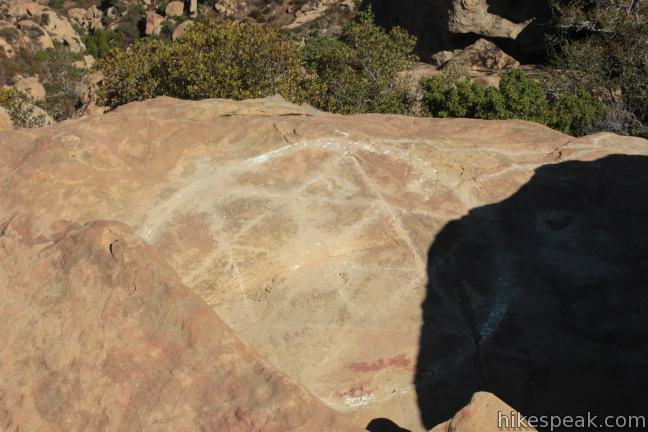 The most worn path actually goes northwest toward another boulder-covered point that is also worth inspecting. 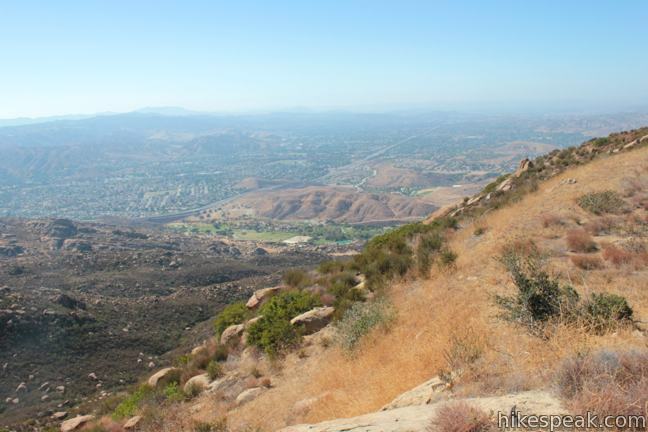 This additional false summit has a bigger western view over Simi Valley. The path continues north along the bluff beyond this point, eventually returning to Rocky Peak Trail. 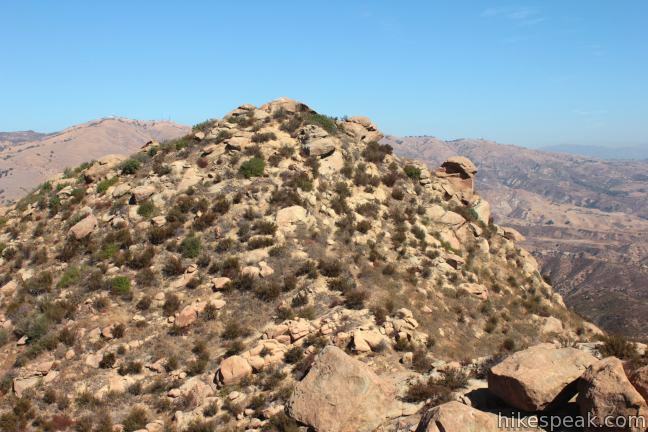 To reach Rocky Peak from the central false summit, follow the footpath across the notch, slinging eastward across a saddle toward the summit of Rocky Peak. 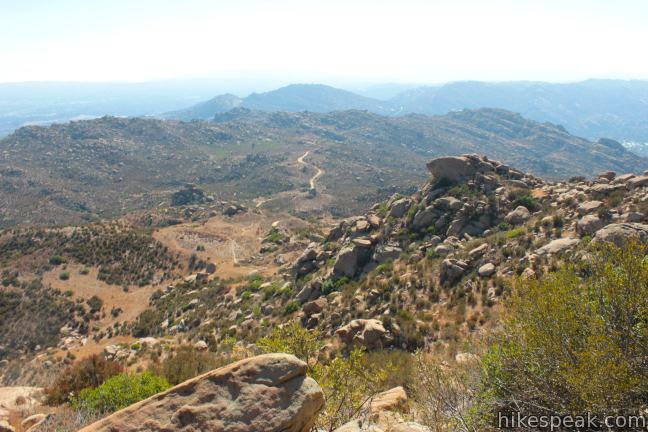 Forge a course through the boulders and brush, scrambling for a tenth of a mile to the summit of the aptly named Rocky Peak. 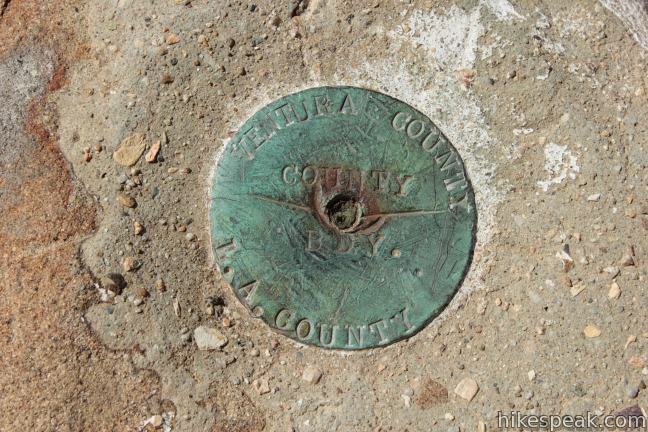 A unique summit marker is at the top, representing the boundary between Los Angeles and Ventura counties. 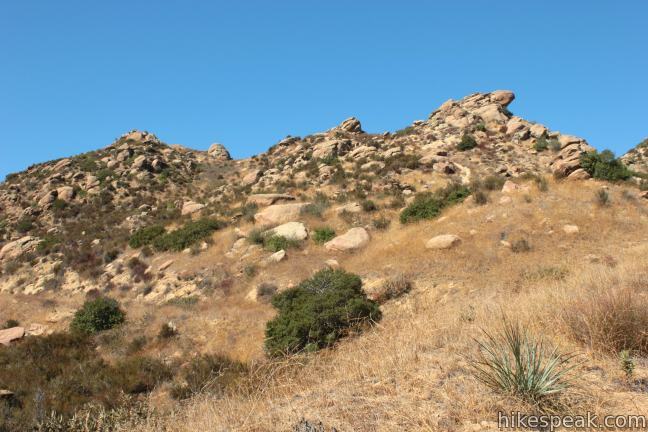 Ambling over boulders to the eastern (Los Angeles County) side of Rocky Peak, you will spot another fun feature on the mountain, an impressive summit register in a metal box standing on a short pole. 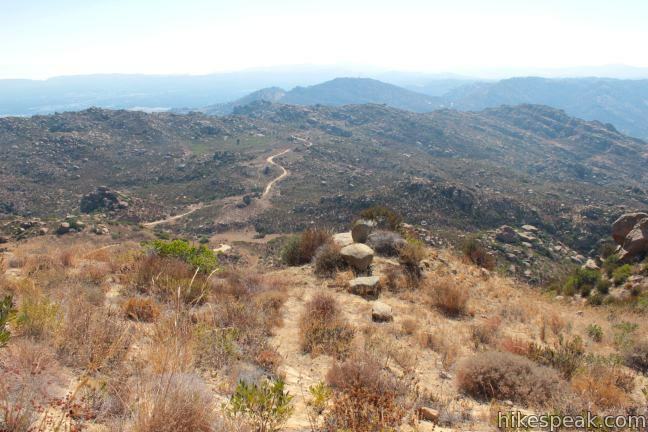 Rocky Peak is one of the highest points in the range, delivering panoramic 360-degree views. 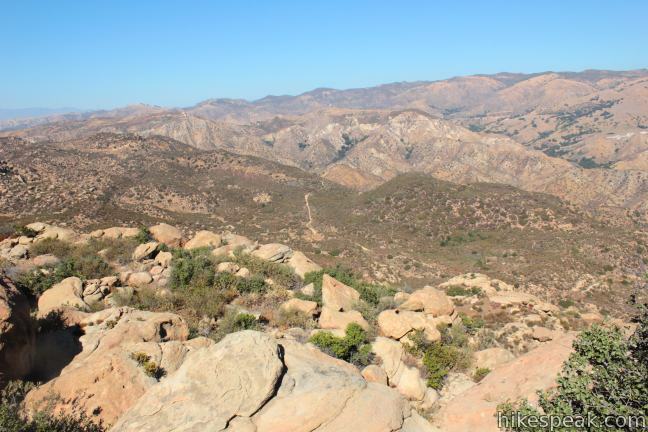 More rugged terrain in the Santa Susana Mountains stretches to the north. 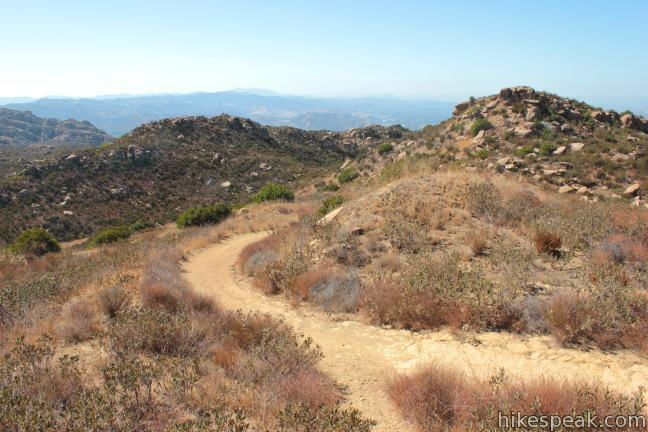 To the south, you can look back over Rocky Peak Trail and jumbled formations, spotting the Santa Monica Mountains along the horizon. 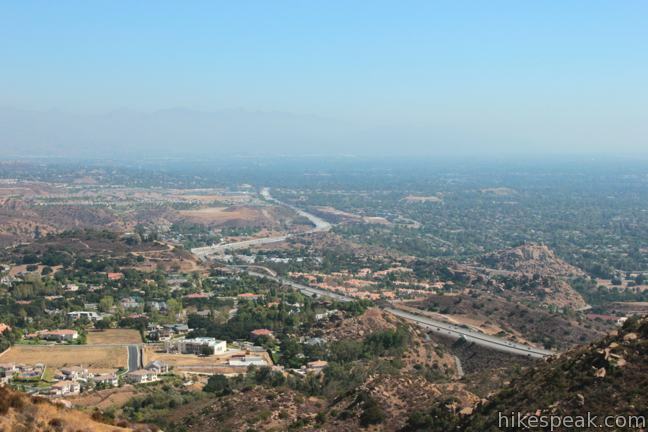 To the east, Rocky Peak makes a dramatic drop to open views of Porter Ranch, Chatsworth, and the San Fernando Valley beyond. The sweeping views are worth the effort. 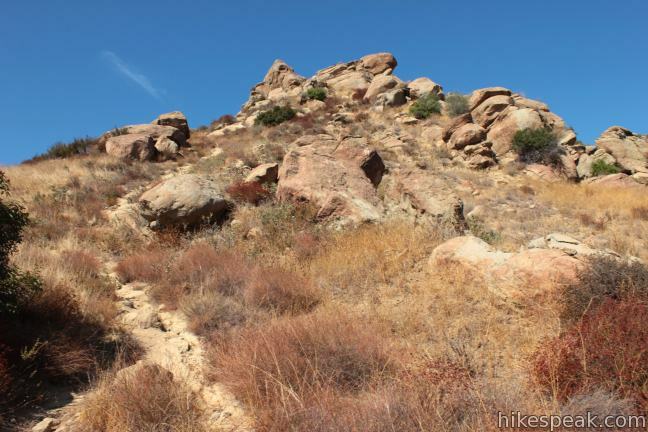 The shortest way back to Rocky Peak Trail is to scramble down the peak and return the way you came. 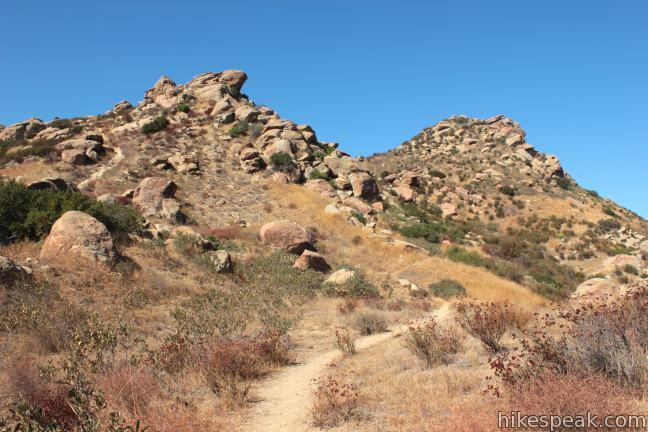 You may also continue up the path, venturing northwest along the plateau beyond the false summits to another junction farther up Rocky Peak Trail. 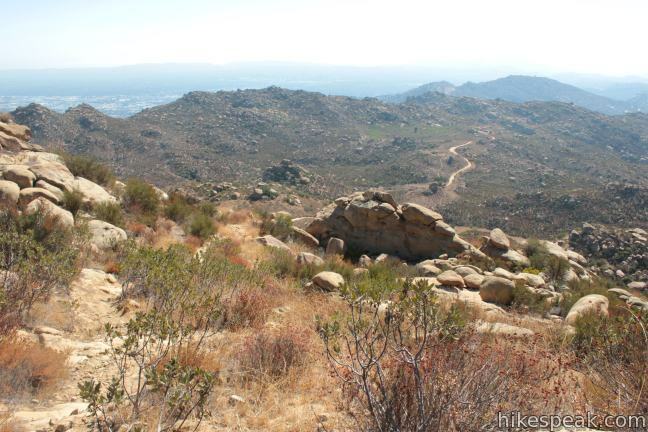 The short route back delivers a 4.75-mile round trip hike. 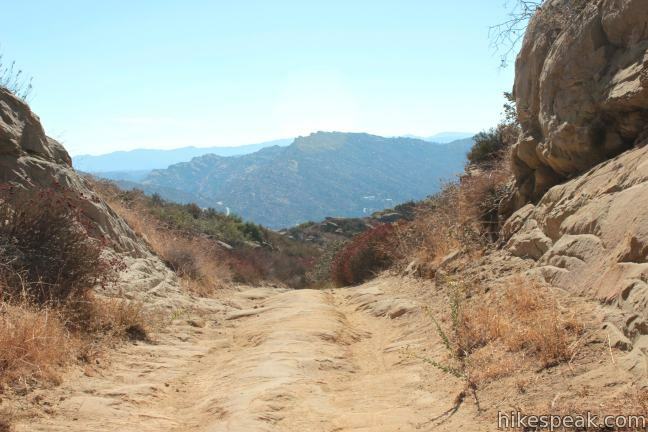 the road and the path to the summit have steep sections, making the trek to Rocky Peak somewhat challenging. 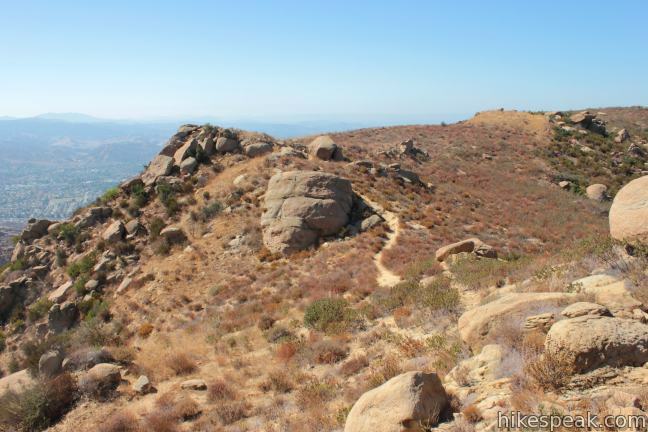 Dogs and mountain bikes are allowed on Rocky Peak Trail, but mountain bikers will not be able to pedal their way to the summit. 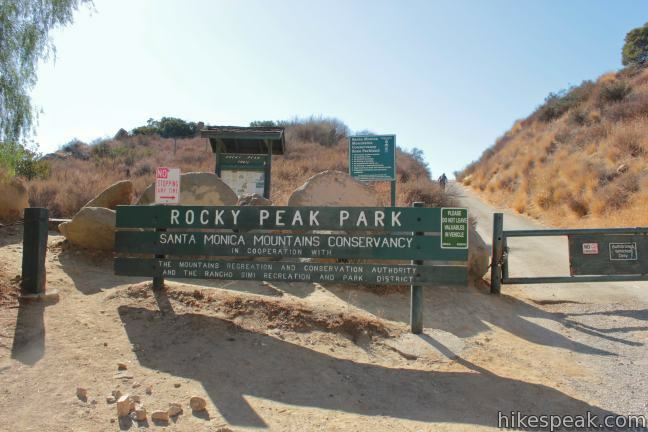 No fee or permit is required to hike in Rocky Peak Park, so get out and enjoy! 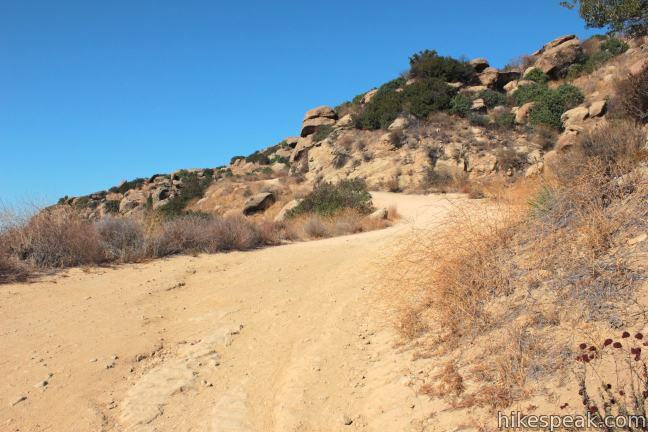 To get to the trailhead: Take Route 118 to exit 32 for Rocky Peak Road (ten miles west of the 405 Freeway). 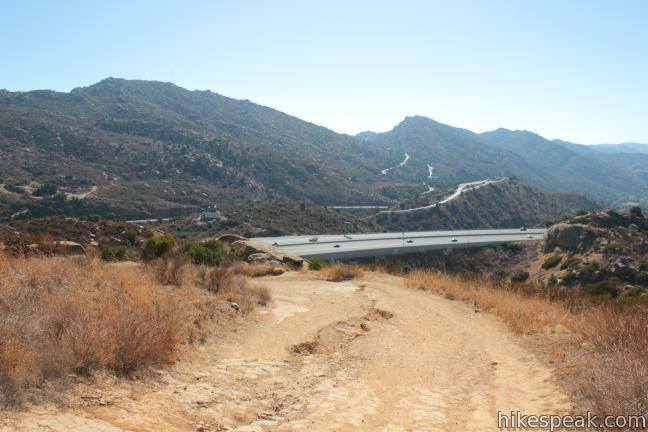 At the end of the offramp turn into a small parking area just north of the freeway at the end of Rocky Peak Road. 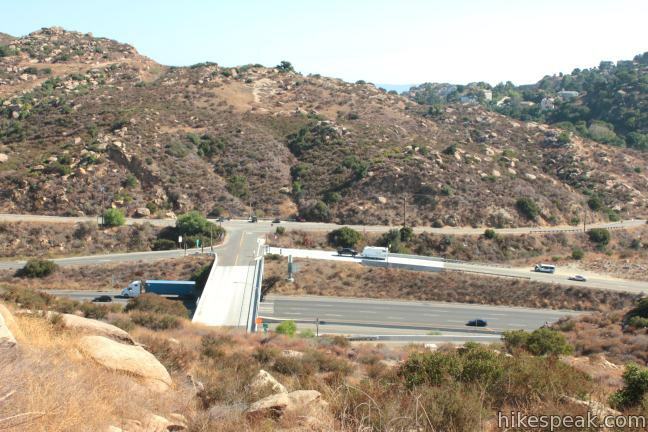 If the spaces by the trailhead are full, additional parking can be found at the south end of the bridge over Route 118. 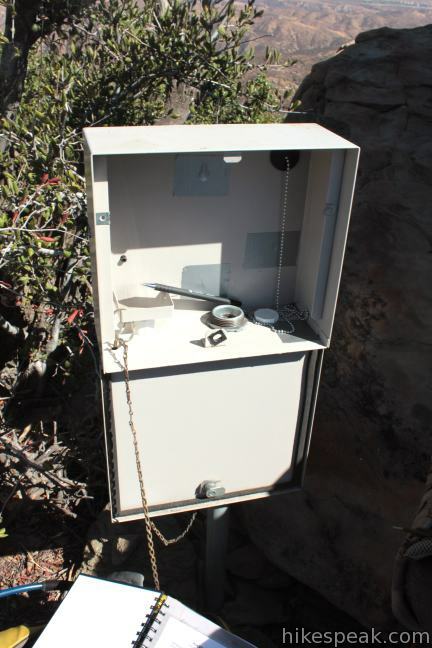 The trailhead has a theft risk, so do not leave valuables visible in your vehicle and report any crime. 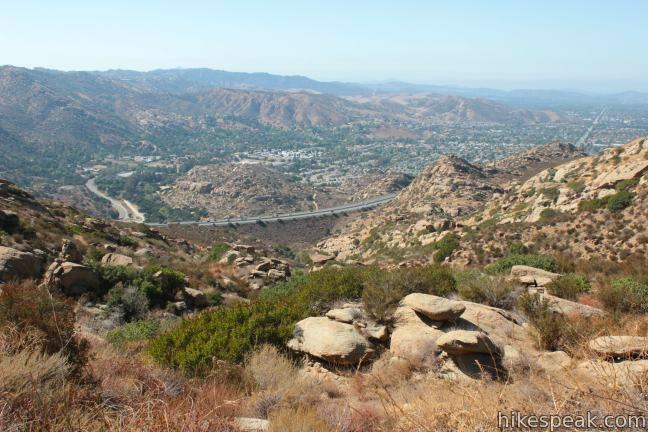 This action-packed 2.1-mile loop has two great attractions, crossing an impressive cave to climb to a rocky peak with views over the San Fernando Valley. 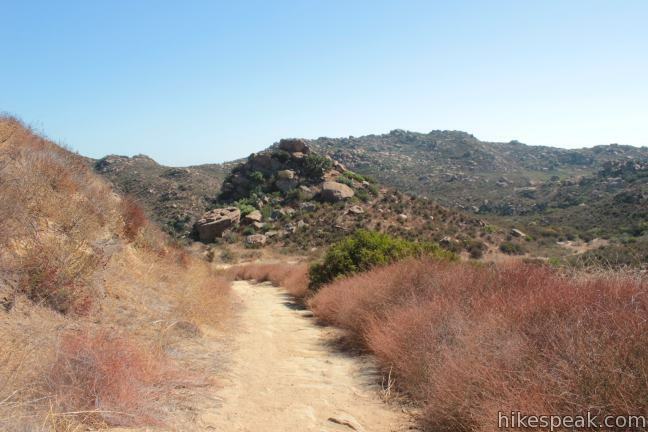 This 5.45 to 6.2-mile hike ventures up rugged ridges to a peaceful oak savanna and a trail to the highest point in the Simi Hills, sporting 360-degree views of surrounding mountain ranges. 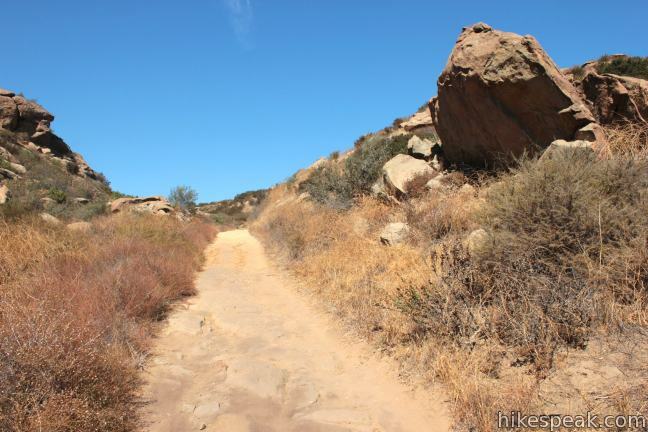 This 5.4-mile loop explores two canyons and scenic ridges in the Santa Susana Mountains, passing the narrows of Towsley Gorge in Towsley Canyon. 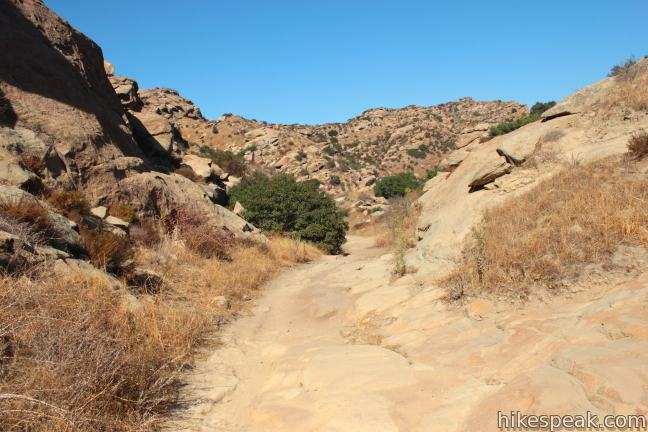 This hike of ten miles or more explores an enchanting narrow canyon on the east side of the Angeles National Forest in the Sierra Pelona Mountains, a small mountain range north of Santa Clarita. 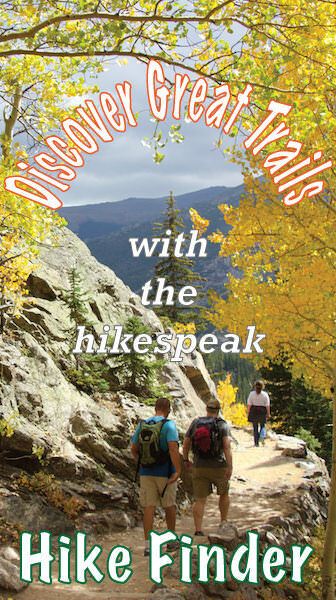 I was hoping you could suggest a trail for total beginners. 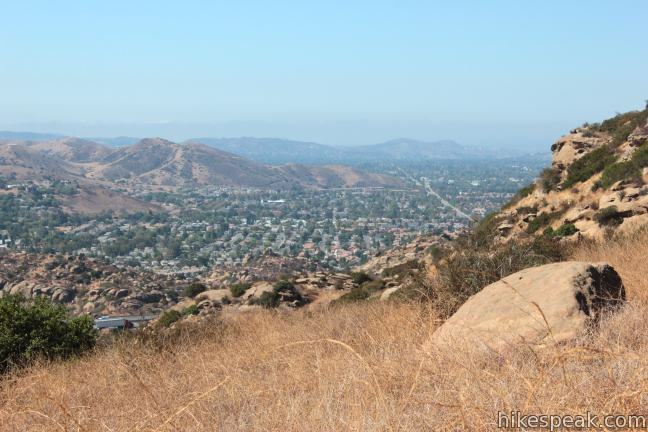 This would be our first time taking our bikes off the bike paths and on to a mountain trail. Any suggestions and recommendations would be greatly appreciated. 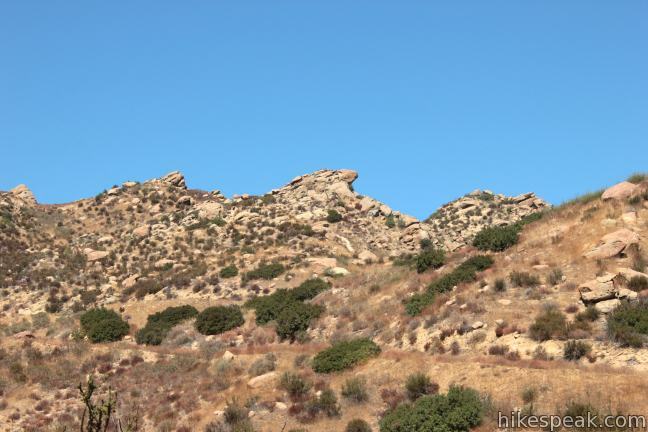 We live in the San Fernando Valley and are just getting started with our mountain bikes. 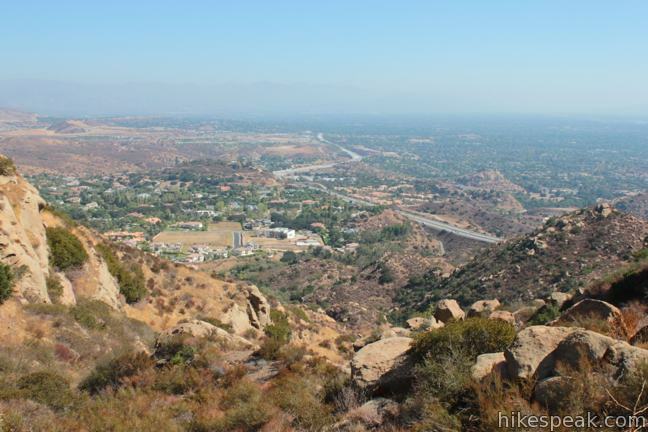 This is a great hike to take your beginner hiking friends that want something a little more difficult. This place is always crowded and the parking isn’t bad at all. 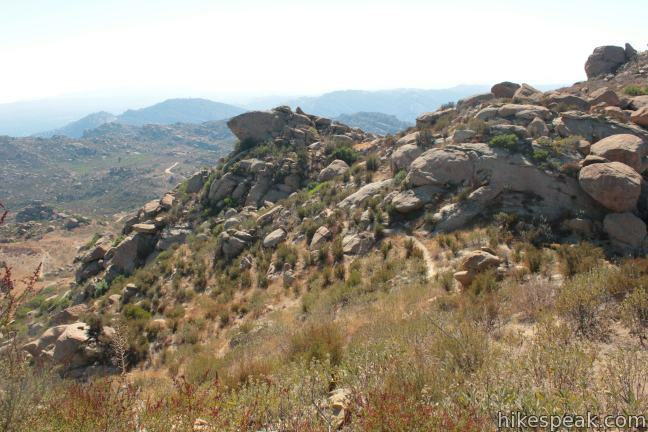 I have hiked Rocky Peak Trail a number of times from Rocky Peak Rd. 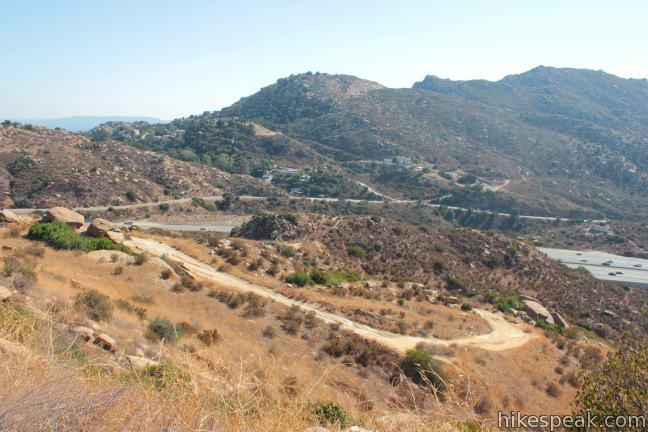 I have also hiked from CorriganVille on Smith Rd. 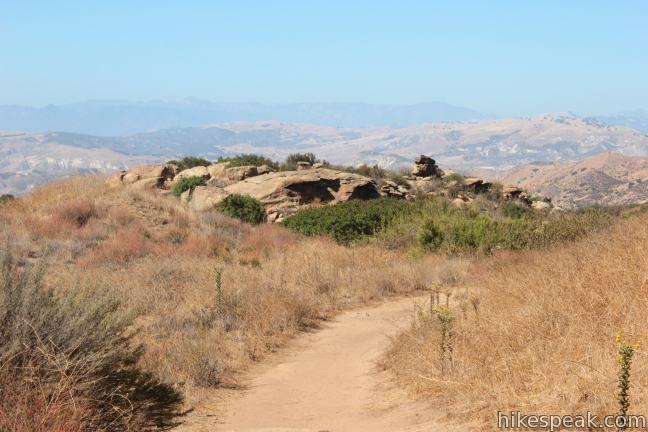 in Simi Valley to Rocky Peak Summit. 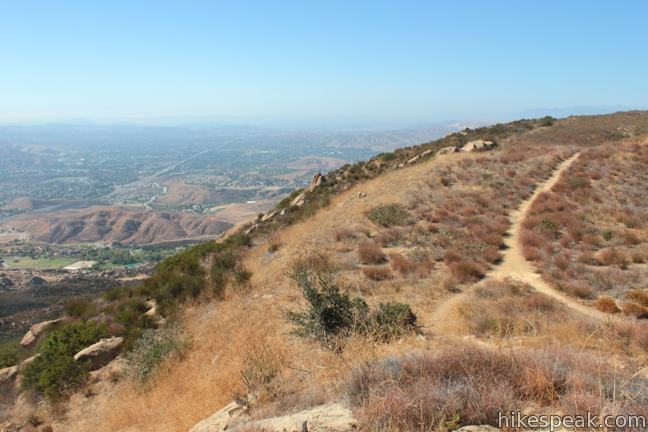 Do you know the distance of that hike? 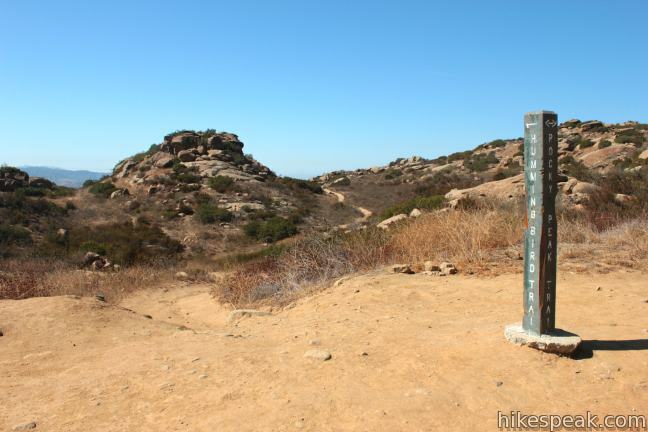 I know the elevation starts at 421 ft. at Corriganville.